The decision to build a new model home/office took a few years and plenty of planning. Owner Jim Hoffman wanted a building design that would incorporate seven offices, a lunch room to accommodate up to thirty employees and most of all feel like a home. The “Crater Lake” model satisfied all concerns and has created quite a stir in the Southern Oregon area. 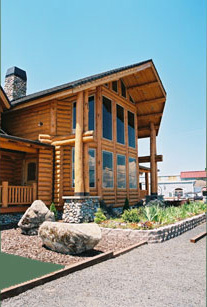 Built right on the main highway to Central Oregon and Crater Lake and completed in April of 2004, this 4,769 square foot log home shows the high quality of craftsmanship Homestead adheres to. Ron Snow of Creative Building Designs, their designer for over 30 years, altered the office plan to create a home design attractive to potential home buyers. This unique floor plan, with four bedrooms and three and a half baths meets the needs for spacious log home living at it’s best. The Company outgrew it’s current Timberline model of 2,440 square feet as business has doubled over the last few years and the size of their labor force increased. The lodge feel of this big structure is embellished by extensive stonework, soaring log roof beams, antler furnishings and exotic hardwood floors. 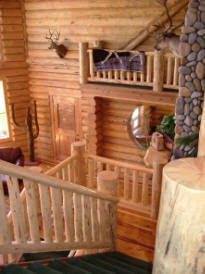 Homestead chose it’s fourteen inch “Scribe-fit” handcrafted style of dry Lodgepole Pine for this model. 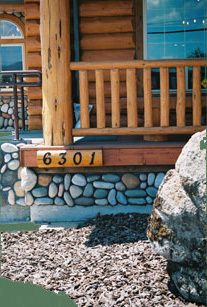 They also produced Swedish cope, Montana, and Canadian log profiles at their mill site in Medford, Oregon. Each home is pre-assembled in a building, tagged for identification, drilled for electrical and through bolts, sanded and sprayed with wood preservative. The home owner views their project before it is disassembled. Then, the home package is unitized, plastic-wrapped and shipped to the jobsite. Two experienced factory builders are onsite for five days with the reassembly process. Some of the interesting features of this model are a wood burning fireplace with fans that not only blow air into the great room, but are ducted into the master bedroom and forced air furnace. Quadra-fire of Colville, Washington recommended their EPA certified 7100FP model that burns firewood or pellets and heats up to 3,500 square feet. 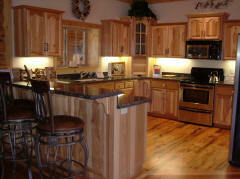 The breakfast nook and kitchen feature Myrtlewood flooring, Hickory cabinets and granite countertops. The custom made front door is Birds Eye Maple with copper hammered inserts, Australian Cypress with Maple bordered flooring abound in the spacious great room. 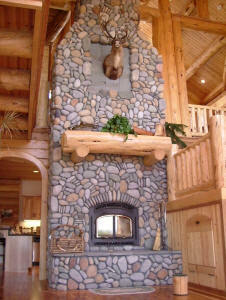 A huge Caribou greets each family entering the home, accompanied by a large stone sheep fully mounted on the log wall. One of the things that was missing from our last office was the feeling of entering a home.” says Jim Hoffman. “This new building not only features a fully functioning kitchen, dining room and great room. But has a large master bedroom, complete with log furniture, a master bathroom with a Jacuzzi tub and shower, and an open loft area. 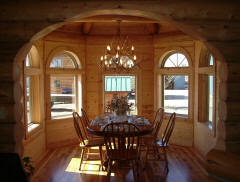 Homestead Log Homes has been a leading manufacturer and builder in this industry since 1978. 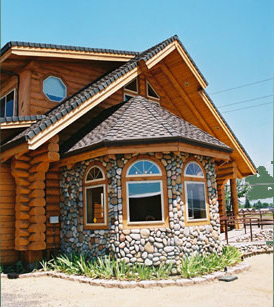 As a long standing member of the International Log Builder’s Association Jim is passionate about producing top quality log home kits at affordable prices. Their main area of marketing is to the Pacific Northwest and Northern California. But, over seventy packages have been shipped overseas to Japan, including a custom 5,000 sq. ft. log restaurant three years ago to Tokyo. Some of their interesting customers to date are Sylvester Stallone, Patrick Duffy, Clint Eastwood and James Brolin. “We try to build homes the way we know we would want them,” says Jim. 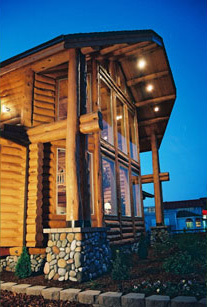 “Big, hand-crafted logs, through bolt fasteners and state of the art saddle-notched, shrink-to-fit corners.” Educated log home buyers can see the difference between a fully pre-assembled package re-erected at their site, or simply logs cut with a notch on one end, dropped off next to the foundation. Homestead sells factory direct with no dealers or middlemen and offers a full color, 96 page brochure with prices and a 20 minute DVD video. A log building seminar is put on each October and March, for customers to view the manufacturing and pre-assembly process. The new model is 5 minutes from Medford and open six days a week.